Imagine a teaching auditorium full of students, each with their own laptop, able to watch whatever is taking place on stage through their laptop and a wireless connection. Not only is the lesson being wirelessly multicasted to all of the student's laptops, but each individual student has the control to pause, rewind and even record directly to their laptop. Seems futurist right? Well, Monsoon Multimedia has created the "special sauce" to do just that today! As Editor at DVR Playground, I have been looking for interesting products and accessories in the DVR consumer electronics space. While researching I ran across a product that some have touted as the "Slingbox Killer" called HAVA Wireless. Recently, Colin Stiles, Executive Vice President of Sales and Marketing, brought over a HAVA Wireless for a demo and a show... read on to see what I thought about the HAVA. Who is Monsoon Multimedia? Monsoon Multimedia was founded less than two years ago by the same people who founded Dazzle back in 1996. Dazzle created affordable hardware and software products that compressed video based on MPEG standards. Then in 2000, they founded Emuzed which was the world's first TiVo type product for the PC based on Microsoft's Media Center Edition (MCE). The HAVA Wireless showing the back connections. The HAVA product was unveiled back at CES 2006 in the ViXS Systems booth. ViXS provides video processing and networking ICs which guarantee high quality MPEG video compression, transcoding and distribution of video over 802.11 networks. Besides using ViXS System's ICs, HAVA employs Intel X-Scale, Philips for tuner/decoder functionality and Atheros for wireless. Similar to Sling Media's three SKU lineup, the HAVA family will include three products: HAVA Wireless, HAVA Pro and HAVA Gold. The HAVA Wireless is the only HAVA product to include wireless and is the price leader in that category at MSRP $249. The HAVA Pro includes all of the features as the HAVA Wireless except for being wireless. The HAVA Pro will be available at an MSRP of $199. Finally, Monsoon's price killer at MSRP $99 is the HAVA Gold. HAVA Gold lacks wireless and a TV tuner but is priced extremely competitively for the entry level remote viewers. The HAVA Wireless is available online at www.snappymultimedia.com now and the Pro will be available online within the next few weeks. The Gold will only be available through OEM partnerships at club stores (such as Walmart or Sam's Club) and not via Monsoon Multimedia's online store. All of Monsoon Multimedia's products will be distributed through several OEM partnerships. HAVA over the Internet in full screen. The HAVA family's main competitors include Sony LFX and Sling Media's Slingbox family. In addition to consumer electronics competitors, several software competitors exist such as Orb, BeyondTV and SageTV. So, how does HAVA compare to these various options? After all, every product listed provides remote viewing of a local video source such as local TV Programming. Also, recorded content can be seen from anywhere in the world over a high speed connection (some solutions may require additional licenses for the client software). This article will concentrate on technological comparisons between the Sling Media, Sony LFX and HAVA since these are all self-contained "placeshifters". The HAVA Wireless implements something called VBooster technology which is the receipe for video over wireless according to Monsoon Multimedia. The VBooster technology allows the box to stream wirelessly from any video source (TV, DVR, DVD, camcorder, etc...) to Wi-Fi enabled clients such as notebooks, cell phones and PMPs over an exisiting 802.11g wireless network. Also, multicast support allows you to stream high quality MPEG-2 or MPEG-4 video to an unlimited number of clients. Finally, VBooster allows for dynamic bit rate control which adjusts streaming and compression for QoS. 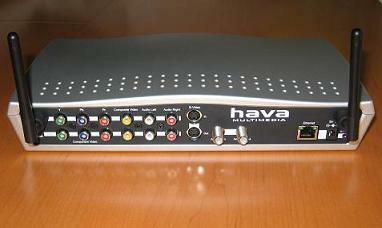 Basically, the HAVA Wireless can be used as a Wireless video server. Sling Media's family of products do not have wireless and Sony's LFX product relies on a proprietary network (would never have guessed that!). Since most living rooms and A/V equipment cabinets do not have an Ethernet network drop, to use the Slingbox most people have to purchase a SlingLink Ethernet Adapter for $100. Both Sony and HAVA Wireless products can be setup as a full Wireless Access Point (WAP). The difference between Sony and HAVA is that HAVA works with your existing wireless network while Sony's LFX requires you to connect either to your WAP or the LFX access point which disables browsing to the Internet, network printing and general network availability! Finally, HAVA Wireless is totally wireless, even from the initial configuration. The device configures itself to your network and connects to the network as a client through an easy wizard-based setup from a laptop. MCE with HAVA in a windows. Neither Sling Media nor Sony provide the following features which are standard on all HAVA units. HAVA has a concept called Mirroring which means that both remote and local viewers can be connected to the HAVA unit simultaneously. Next, Multicasting allows you to multicast video in MPEG-2 quality (DVD quality) across the local network to unlimited clients. Also, HAVA brings DVR functionality down to the clients so you can pause, rewind, fast foward and even record and burn video to your laptop in MPEG-2 format! Multiple local networked clients can perform DVR functions independently; therefore, as one client is watching the show, another could have the show paused while yet another client could be recording the show. Currently DVR functionality is turned off for remote or non-local networked clients while service providers determine if that capability is legal. All HAVA units except Gold also come with a TV Tuner. Finally, MCE support is standard. 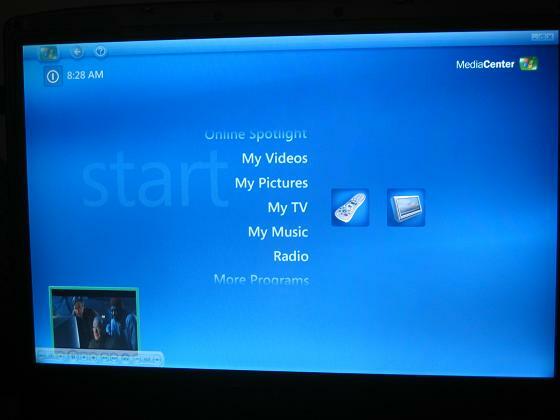 HAVA provides a plug-in for MCE that sets up the HAVA unit as a virtual TV tuner so no hardware is required. What's the use in that? Well, most MCE machines sold today are sold without a tuner and with a HAVA unit you do not need to install a tuner in your machine! Also, you do not need a USB TV Tuner to enable the full functionality of MCE such as time shifting, recording and burning on your laptop. High Definition (HD) is supported on both the Slingbox and HAVA families. 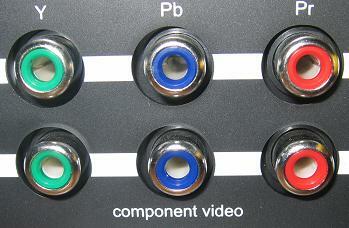 HD on the Slingbox requires that you purchase a $50 cable that plugs into the faux HDMI port. HD Component comes standard on all HAVA products. Sony does not support HD on their LFX products. Both HAVA and Slingbox support HD resolutions of 480p/576p, 720p and 1080i but HAVA downscales to full D1 while Sling only downscales to 640x480. As far as video resolutions supported, HAVA and Sony LFX both support up to D1 with full resolution while Sling only allows up to 640x480 full resolution. HAVA supports data rates from 128Kbps to 15Mbps while the Slingbox Pro only supports 128Kbps up to 8Mbps. Sony's data transfer rate is unknown. Finally, HAVA provides IR Emitter support allowing remote control of your video devices. It seems like Monsoon Multimedia thought of everything while creating the HAVA products. The only two issues I came up with include the configuration of the network TCP/IP port you connect to remotely and your inability to switch devices that are plugged into the HAVA. As far as not being able to configure the TCP/IP port you use remotely, Sling Media does provide this ability which is useful as some places are very restrictive and only allow certain ports outside of their network (Ports 80 and 443 which are web-related for instance). In this case, HAVA and Sony's LFX would not work. According to Colin, the ability to modify the HAVA outgoing port will be available in the second revision of the software. Regarding the inability to switch devices, the technical reasoning is that there is currently only one audio. Monsoon Multimedia has already started the process of adding another audio in within the next thirty days. Currently, HAVA has client platform support for Windows and Windows MCE. HAVA will have support for multiple WiFi devices including PMPs, PDAs, etc... The Windows Mobile Client should be completed around the middle of November. There is planned support for Symbian/Java in Q1 2007 and Macintosh support possible in Q2 2007. While HAVA was developed on the Linux platform, there is no plan for a Linux client as of yet. While this article is more of a review of the technical attributes of HAVA, I wanted to see the HAVA Wireless in action so Colin brought along a DVD player, a HAVA Wireless, a Dell laptop and a Gateway laptop. First, Colin quickly setup the HAVA Wireless, turned the laptops on and connected everything. I was immediately impressed by the wireless multicasting of MPEG-2 (DVD) quality video - it was flawless! While one laptop continued to stream the video from the HAVA Wireless, Colin showed off the DVR functionality on the other computer. 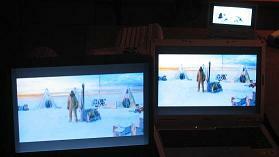 We were able to pause and rewind video as well as record directly on the laptop. Next, connecting through a slow wireless connection, we connected to a HAVA Wireless three time zones away and watched the Fox morning show in San Mateo in full screen. Slingbox cannot display in full screen remotely. While I am not ready to crown the HAVA product line as the "Sling Killer" yet, the demonstration of the technical abilities of the product was most impressive.